Well, how about that? A hefty upside surprise from the jobs report. Employers added 243,000 jobs last month—257,000 in the private sector—with gains across most industries. And the unemployment rate ticked down from 8.5% to 8.3%, the lowest it has been since Feb 09. Technical issues having to do with fun stuff like revisions and seasonal adjustments are playing a role in the monthly numbers right now so it’s good to average over a few months. Over the last three months, the average rate of job growth has been 200,000, compared to about half that if you go back a few months. As I stress below, today’s report contains a critical message for policy makers; we’ve got some real momentum here on the most important economic issue to the American people–JOBS…let’s not screw it up. As shown in the charts—with apologies for the lame-looking arrows—the trend is our friend both on the unemployment rate and net job growth. Source: BLS, with my arrows, obviously. –8.3% unemployment is still evidence of a very slack labor market, with 12.8 million unemployed and millions more underemployed. –Long-term unemployment is still historically very high, over 40%. –243K is a good number, but it’s a good number in the context of a slow recovery. Historically, it’s not been at all unusual to see gains of this magnitude coming out of a downturn. –Weekly earnings are up 2.5% over the past year. That’s still probably behind inflation, which has been running at around 3% (we don’t yet have inflation for January). –The payroll graph shows we’ve been here before. Friendly trends can be obliterated by bad shocks—Europe, oil, and especially fiscal drag are still very real downside threats. 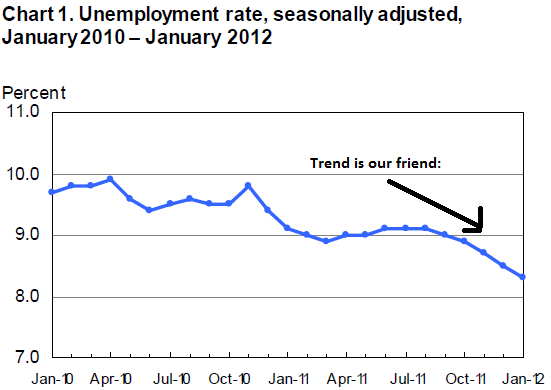 Re that last point, as I wrote yesterday, this is your unemployment rate under fiscal drag. While policy makers are very unlikely to follow current law—full sunset of Bush tax cuts—in the near term, they’re also unlikely to go the other way—to add a fiscal boost to the recovering job market. Even extending the payroll tax cut and UI benefits is proving—predictably—to be a heavy lift. This jobs report, which clearly shows positive momentum, should force Congress to absolutely seal that deal immediately. From the perspective of working families, the most important part of the economy is showing some improvement. We’re not talking banks, GDP, industrial production, credit flows, deficits, interest rates—we’re talking JOBS. Let’s not screw this up. 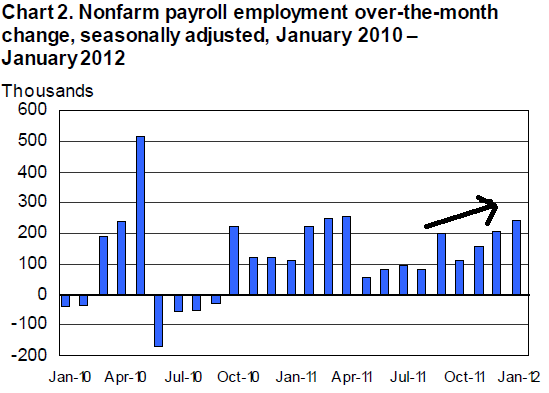 Share the post "Jobs Report, First Impressions"
6 comments in reply to "Jobs Report, First Impressions"
Thank you. As you said, the numbers showed slow positive momentum. I note that the drop in the unemployment rate was influenced by a drop in the labour force participation rate from 64.0% in December 2011 to 63.7% in January 2012 (s.a). The employment-population ratio did not improve much. Regards. You beat me to it. I’m glad there was some positive momentum, but the employment to population rate is still at a level not seen since the mid-1980s and barely off the recession low of 58.1%. We still need more fiscal stimulus to get us out of this trap. The ‘Let’s not screw this up’ line will be considered a challenge to the teavangelicals & their conservative brethren. Lush bin Limbaugh is already twisting the #’s, as well as the CBO report,soon to be followed by Genghis Sean & on & on throughout the reactionary religious radio scene til the message & water carriers are exhausted…or when the next battle call is heeded from the Kochs, et al. Someone sent me link to this site, which I’d never heard of, site claims 1.2 M dropped out of labor force in 1 mo? Can’t be right. Don’t see that in BLS figures.How can that be when “the civilian labor force participation rate held at 63.7” and the # of discouraged workers was the same as a year earlier and total discouraged workers was only 1.1 million. Hey, remember when Obama spent a year talking about the deficit during 9% unemployment? That was awesome.